In a large pan, saute celery, mushrooms and onions in butter and olive oil over very low heat until the onions are translucent. Do not brown. Add to bread cubes in bowl and add the spices and herbs. Combine with egg and broth. Form medium-sized balls. Refrigerate until ready to use, up to overnight. Place balls in the bottom of the roasting pan under the rack and around the turkey (or chicken) on the rack for the last 1/2 hour of roasting and cook until cooked through. I love stuffing. Sometimes I make a whole turkey or chicken just so I can make stuffing. 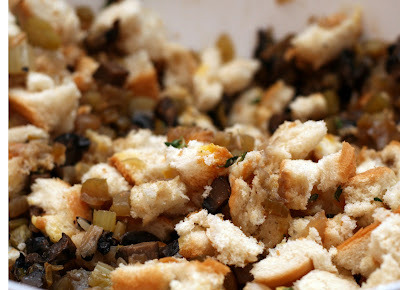 Of course, this is technically not "stuffing" but it is way better than the in-a-separate-dish "dressing" people make. 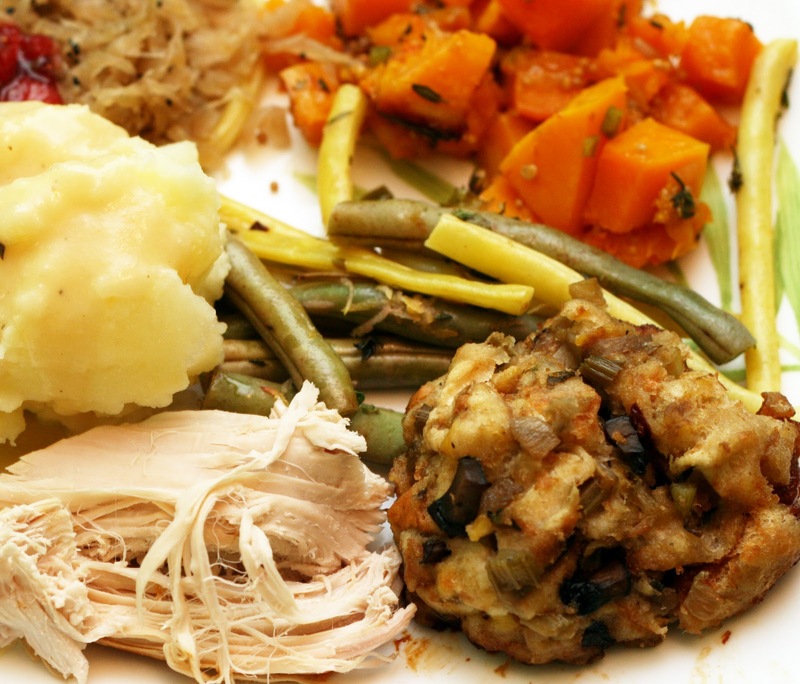 It is the best of both worlds: infused with juices from the turkey and crispy around the edges. Yum, yum, yum. My mom made stuffing this way growing up but much plainer. The herbs and meaty mushrooms add a lot to the awesomeness. My brother was so enthralled by it, he packed a baggie full of stuffing scraps to take home.